Installation view with Betty Woodman's "On the Way to Mexico" in foreground: Vessels, The Horticultural Society of New York, May 7 – July 3, 2013. 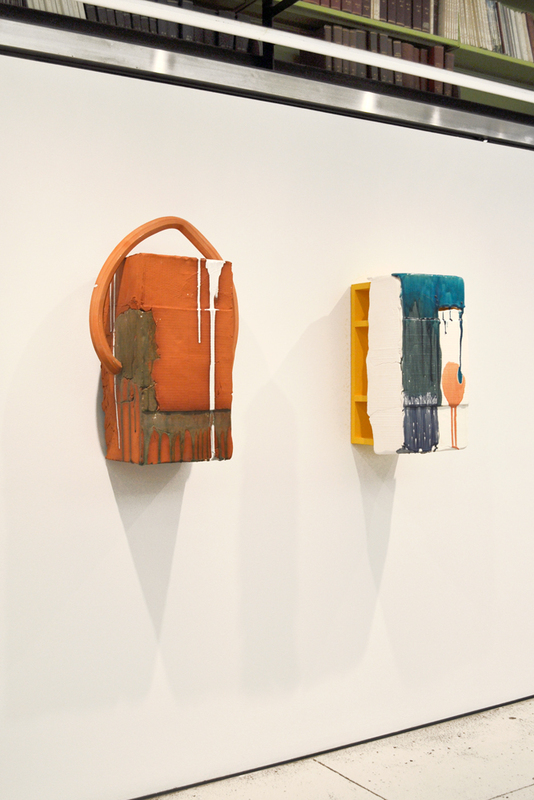 Installation view of Vessels with Nicole Cherubini's "Earth Pot 2" and Beverly Semmes' "Teapot." Nicole Cherubini's "White Drip with Arch" and "Lazy River" (both 2012), Courtesy the artist and Tracy Williams Ltd.
Francesca DiMattio, Putti Vase, 2013, Underglaze, gold luster, and enamels on porcelain, 23 x 12 1/4 x 12 1/2 inches, Courtesy the artist and Salon 94, NY. 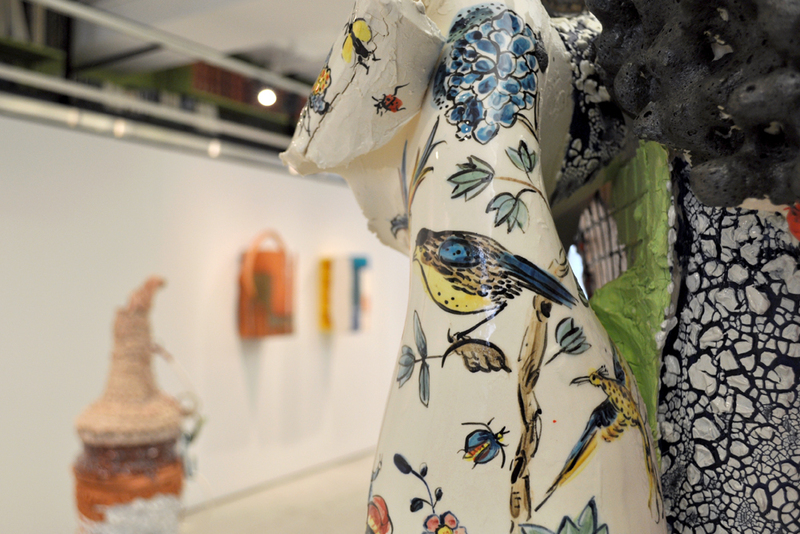 Installation view with Francesca DiMattio's "Putti Vase" in foreground: Vessels, The Horticultural Society of New York, May 7 – July 3, 2013. 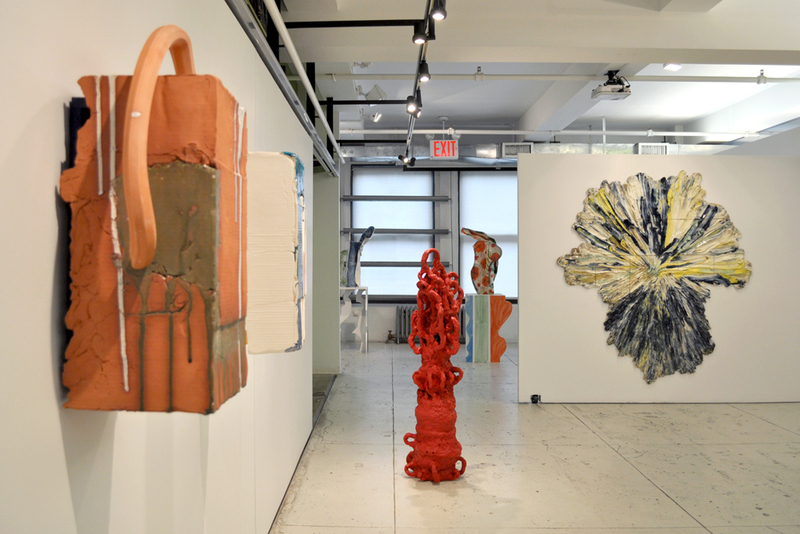 Installation view: Vessels, The Horticultural Society of New York, May 7 – July 3, 2013. 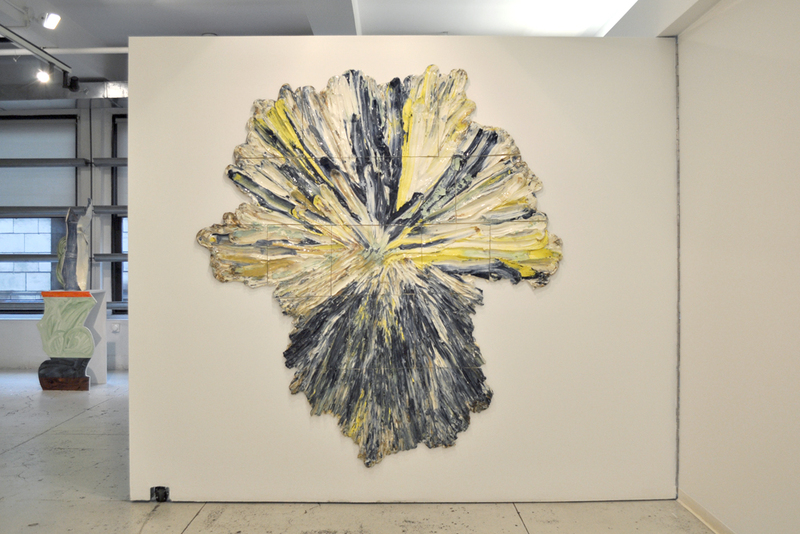 Brie Ruais, Unfolding (Liquid Color), 2011, The artist's body weight in clay spread out in all directions; Stained blue, yellow, and green clay, white and brown stoneware, fired with clear glaze, 75 x 67 x 1 inches, Courtesy the artist and Nicole Klagsbrun, NY. Detail of Brie Ruais' Unfolding (Liquid Color), Courtesy the artist and Nicole Klagsbrun, NY. Installation view of Vessels with Betty Woodman's "Vase Upon Vase: Joy" (2011) and Beverly Semmes' "Eye" and "Slippers" (both 2012) from the Feminist Responsibility Project.